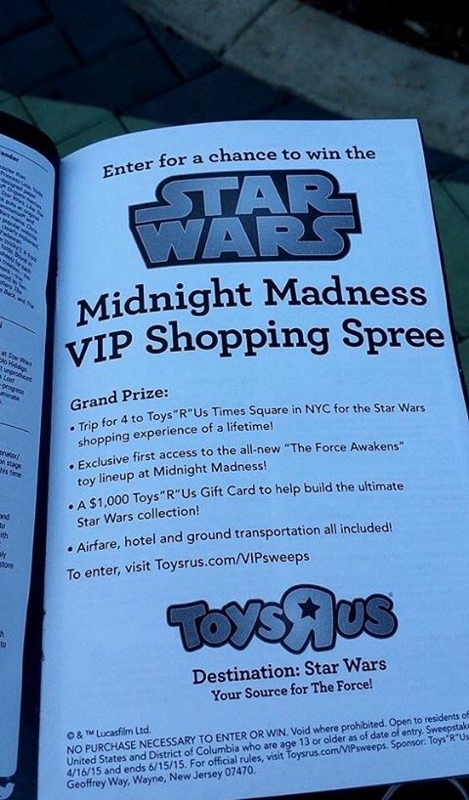 Our friends at the Wolfpack Podcast have confirmed, via the Star Wars Celebration Anaheim booklet, that a Midnight Madness release of product for The Force Awakens is heading to Toys ‘R Us, and that one lucky person will win a VIP shopping spree. The fine print lists a contest date of 4/16/2015 through 6/15/2015, and a website is mentioned, but isn’t live yet. No other details are listed, such as which stores are participating or when the Madness takes place. Hopefully, we’ll find out more during Celebration this weekend.